any clarity on the drivers allowed? Just wanna ask about memory restrictions rule, which is "Galax HOF OC Lab Edition DDR4 4600 CL 19 only". So i assume with this rule, all submission to this competition must use the Galax HOF OC Lab Edition DDR4 4600 CL 19 only? Or can I use another GALAX memory for 3D submmision? - For 2D benchmarks can we use another brand / GALAX VGA? Like GT 730?! - For TS & TSE is it total score / graphics score only? If graphics score only, can I run as a custom run?! Galax 4600CL19 and 2080 Ti as hardware restriction: this means no other gpus or Galax memory versions, no matter the bench. It is GPU score only so you can select custom, but no alteration in the benchmark settings. 1 more question to making sure the things.., I must include GPUz window in 2D benchmark submission to verify we are using the Galax RTX 2080Ti ?! Because i think there's no Windows XP driver for RTX at the moment (if someone use Windows XP capable boards for 2D benchmarks). Thus, GPUz will show Generic 'Microsoft Basic Display Adapter' detection. You need a VGA driver for Pi ? Can I use 3.2 for GPUPI version? Do I have to use Galax HOF OC Lab Edition 2080 ti on this bench? I'm curious if anyone else has had their hardware delayed from Galax. Theres been some sort of production delay on my GPU pot, (GPU backplate as well, but obviously not necessary for benching). I spoke with Gary from Galax via email and he stated that if there's enough request by those affected that they would consider extending the contest deadline. Just looking to get a headcount on people who are still waiting on hardware.
" Screenshot must contain CPU-Z CPU, memory and SPD tab and GPU-Z for 3D stages "
For 3D stage only main GPU-Z or also sensor TAB ? 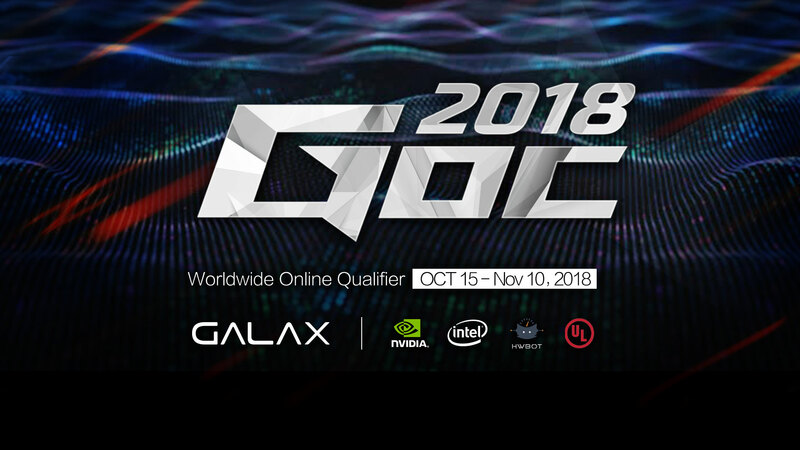 I hope to get it soon, less than 10 day for this high level contest, with work, family... and as we all spent 2000$ on galax hardware I guess we all hope to have enough time to bench it properly. By the way, the OCer who got practice in GALAX OC LAB are alowed to join the qualification ? are the qualified already for final ? On the e-sports site are the points 10-8-6-4-2 and on the competioton overview you have 50-48-46 etc what is the right pointsystem? I assume SPD should be shown on all stages as we got to use the same kit on all of them. As far as I know, the only people that qualified are the winners from previous years + Rauf for winning the qualifier in 2017. I I think many people have bought more than two kits，Why limit their use? My bad; meant that we got to use the new mems for all stages and that older ones are not allowed.